Of the major Jewish holidays, the seven days of Hag HaMatzot ("The Feast of Unleavened Bread") are among the richest with tradition and history. Passover, as the week-long feast is generally called in English, is a time of national reflection and praise to God for transforming us from slaves in Egypt into a free people on the verge of entering our own land. The traditional Egyptian Karaite Haggadah comprises mostly of verses from the Tanakh, and is almost entirely a retelling of the Exodus. 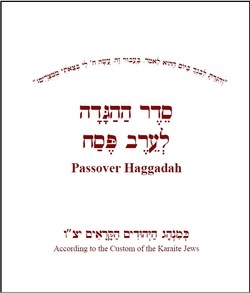 Below you can download some Passover resources, including copies of Haggadot and audio files with the traditional Egyptian Karaite Passover melodes. If you are interested in learning more about the rules for Hag HaMatzot, please visit our Reading Room and read Section 5 of Mikdash Me'at. Download this newly formatted Haggadah, which contains biblical text according to the Aleppo Codex, transliterations, translations, and songs for the Passover seder. This Haggadah was inspired by a recent publication by the Karaite Jews of Israel. These audio clips were produced by the B'nai Mikra Choir in Israel for the Israeli Karaite Haggadah produced in 2012, and should track the newly formatted Haggadah almost exactly.